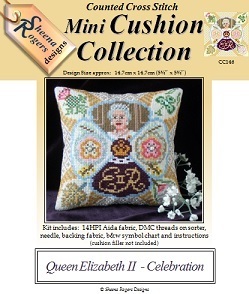 This mini cushion design was inspired by the Queen's Coronation Dress and Robe, and features motifs of flowers from around the commonwealth, plus the Queen's initials as embroidered on the purple Coronation robe. This kit also includes silver-lined seed beads and two larger pearly beads for that added touch of sparkle. With Queen Elizabeth II now in her 90th year, this design is a delightful celebration of Her Majesty's reign. This cross stitch kit includes: 14HPI white aida fabric, ready-sorted DMC stranded cotton threads on a card sorter, seed beads, needles, backing fabric, b&w symbol chart and full instructions (cushion filler not included). Only whole cross stitch is required, with some backstitch details on the Queen's face, plus the addition of the seed beads (full instructions provided).